The Albany, N.Y.-based Capital District Transportation Authority’s (CDTA) board of directors rolled out a real-time passenger information (RTPI) pilot program for its fleet of fixed-route buses. RTPI takes the guesswork out of waiting and puts the power of riding in the customer’s hands by using automatic vehicle location (AVL) software to determine bus location and speed. Customers will be able to access real-time transit information for CDTA fixed-route services through the free CDTA iRide mobile application for Apple and Android devices, through Google Maps’ mobile apps and maps.google.com, through the trip planner on its website or by speaking with a customer service representative at CDTA’s call center. Customers will now see a gray clock icon near a route that indicates real-time information is available. Real time is currently not available on Northway Xpress service. Real-time passenger information has been available to bus rapid transit BusPlus customers since its inception in 2011. Customers can access real time information by downloading the free BusPlus application for devices operating on Apple and Android platforms. Customers can also access BusPlus real-time passenger information through digital signage at stations, online, through text messaging and via e-mail. 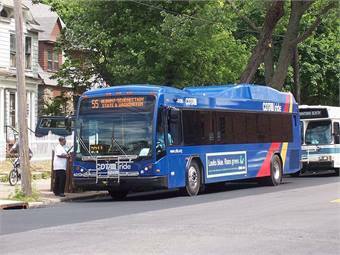 CDTA tracks its vehicles using GPS devices to report bus location data back to its servers. The information allows CDTA to estimate when the buses will arrive at a stop. If a bus goes off its regular route, the system may not be able to fully predict accurate arrival times.